I managed to visit the new home arena of the Edmonton Oilers, Rogers Place, twice this week for two separate games. 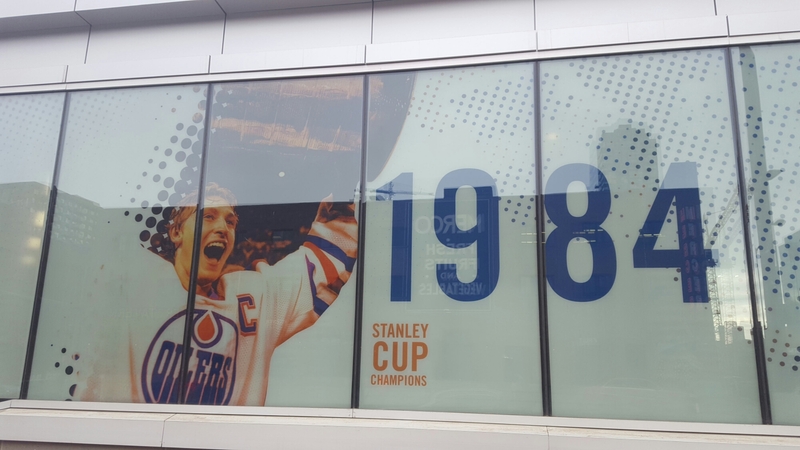 Rogers Place replaced the Coliseum, a building that was not entirely beloved but did play host to numerous important games and events – in particular, saw Gretzky and the 80s-era Oilers win five Stanley Cup championships in seven years. While the Coliseum was not far from the city core, Rogers Place is directly in downtown Edmonton and includes a surrounding entertainment space called “Ice District” which is largely still under construction. 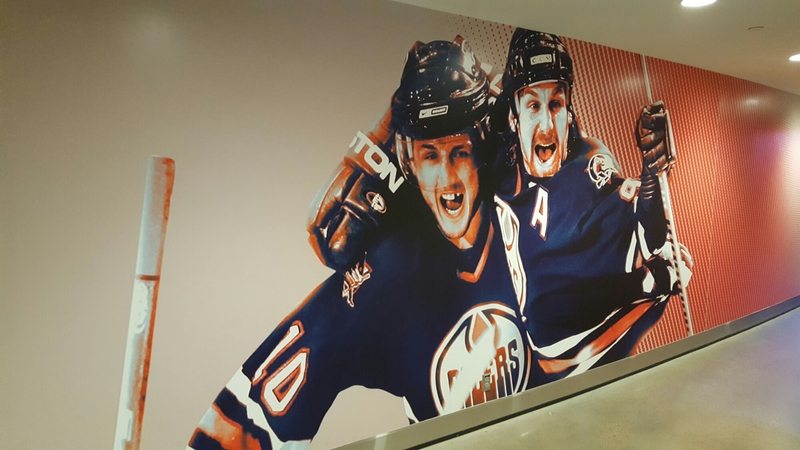 From a heritage standpoint, there are a few attempts to give Rogers Place a sense of continuity and legacy – in particular, with the “Glory Years” of the 1980s. There are numerous street-level displays commemorating past Hall of Fame players and championship seasons. 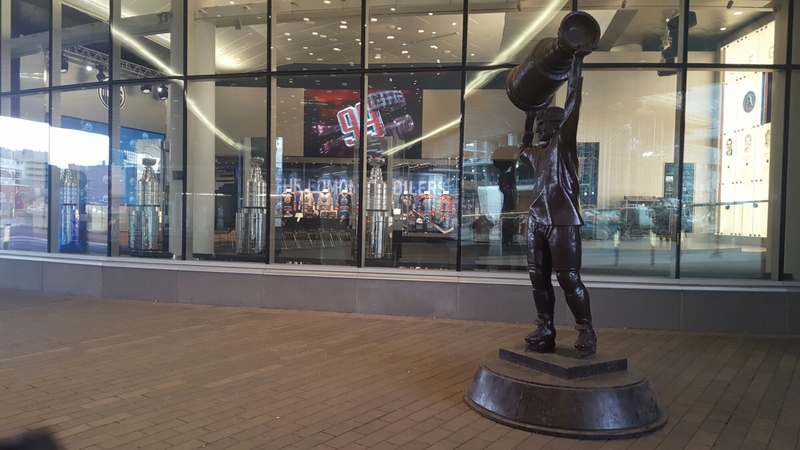 A statue of Wayne Gretzky, that stood in front of the Coliseum since 1988, has been relocated to Rogers Place and now sits in front of an Oilers Hall of Fame (which also appears to double as a press conference room and event rental space). It appears that there is no public access to the hall of fame. 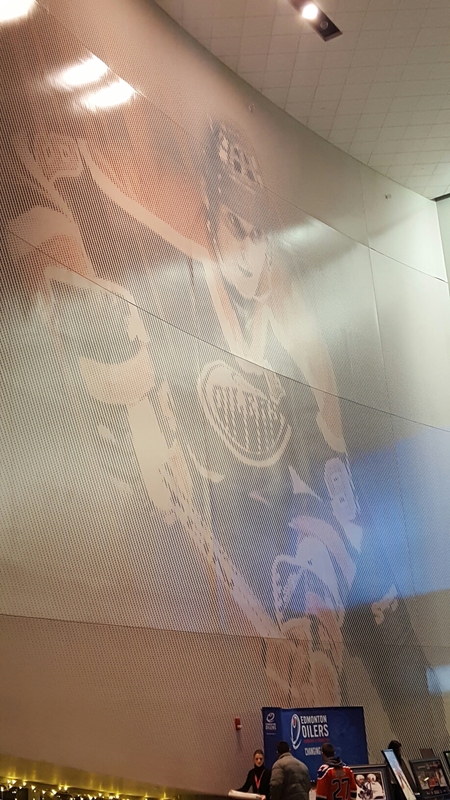 Inside the building there are a few large stylized photos of past Oilers, focusing again mainly on the 1980s championship-era teams. There were a few more contemporary photos from more recent teams, including current players, but the heritage focus is very time specific. 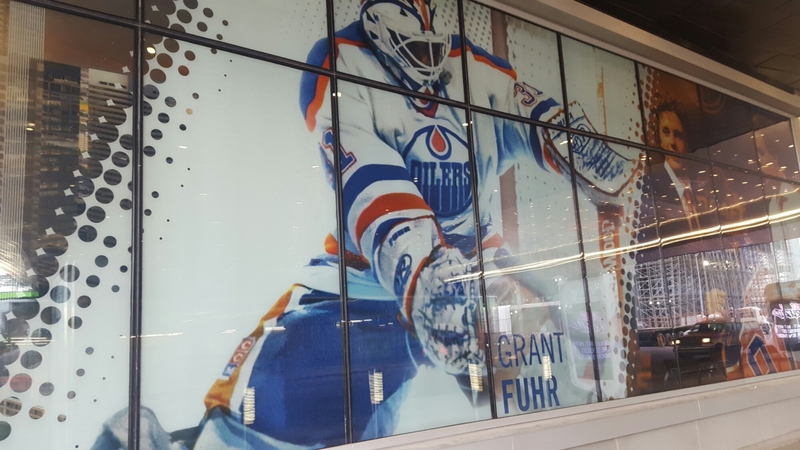 Popular Oilers from other eras – such as Tommy Salo, Curtis Joseph, Kelly Buchberger, Doug Weight, and Jason Smith – do not appear to be represented, at least in spaces accessible to fans. Given that a fan would have to be at least 35 – and probably over 40 – to have any direct memory of the 80s teams, the choice is a curious one. Furthermore, the Oilers have a pre-NHL heritage from when they played in the now-defunct WHL and which doesn’t appear to be represented. In addition, the other main tenant of Rogers Place is the Edmonton Oil Kings, a major junior hockey club with a long history of success. However, outside of championship banners, there doesn’t appear to be any recognition of that team’s heritage. 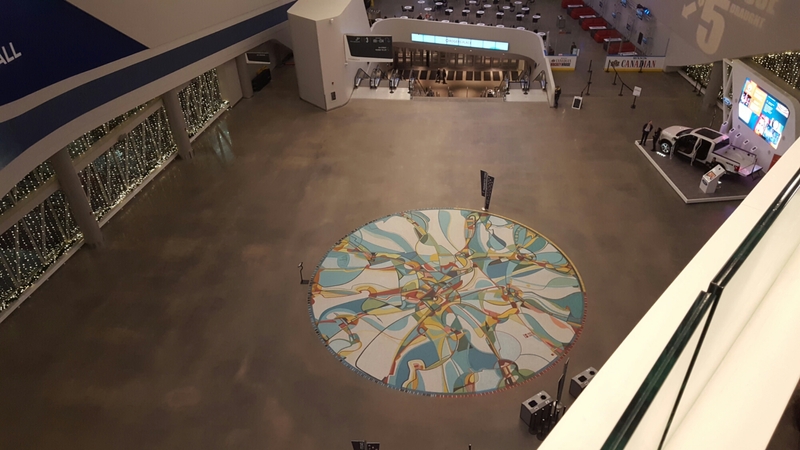 One welcome non-sport heritage touch are that there are several public artworks in the building, most noticeably Alex Janvier’s Tsq Tsq Ke K’e (Iron Foot Place) mural at the front entrance. As a sporting venue, Rogers Place is a mix of some of the best and some of the worst of sports stadiums. The design and many of the spaces in the arena are impressive. However, a lack of toilet facilities, public water fountains, congestion in concourse spaces, and extraordinarily uncomfortable seating in the upper levels, makes viewing a game there as a mixed experience at best. Indeed, the difference between sitting in the upper and lower levels is as extreme as I’ve experienced at a sporting venue. By Gregory Ramshaw in Uncategorized on January 19, 2017 .